Organization calls on the public to be smart about safety when traveling. Magen David Adom (MDA) has stepped up its ambulance and medic force ahead of the Passover holiday, it announced Monday - increasing shifts, utilizing volunteers on motorbikes and mobile assistance units to provide a boost for emergency medical services nationwide. MDA is on alert ahead of the holiday, which sees hundreds of thousands of Israelis attend activities outdoors and in crowded venues, especially parks and beaches. 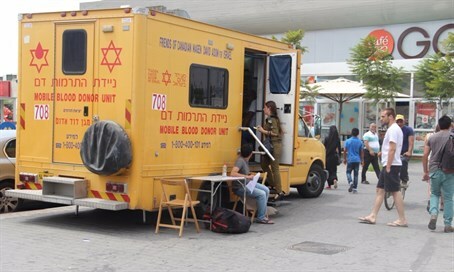 In addition, the organization calls on the public to continue donating blood during the Intermediate Days of Passover, due to the expected decline in blood donations during the holiday. MDA has placed Donation centers in malls and at tourist attractions to encourage donors. "MDA prepares reinforcements every year during Passover," MDA Director Eli Bein stated Monday. "Our forces are being trained and prepared for any possible scenario during the festival in order to grant immediate medical assistance at every call." "I am asking the public to give more attention to the safety of children while outside the home, keep safety rules during hikes and drive safely on the roads," he continued. "I [also] urge the public to listen to the requests of MDA blood services and donate blood to help and continue to maintain the supply of blood required, for the benefit of those who might need it during the holiday."